The most prestigious and revered honours in the country, the Padma Awards list for the current year is out on 67th Republic Day. These awards are conferred by the President of India at ceremonial functions which are held at Rashtrapati Bhawan usually around March/ April every year. 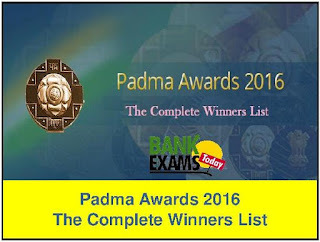 Padma Awards is one of the highest civilian Awards of the country, are conferred in three categories, namely, Padma Vibhushan, Padma Bhushan and Padma Shri. The Awards are given in various disciplines/ fields of activities, viz.- art, social work, public affairs, science and engineering, trade and industry, medicine, literature and education, sports, civil service, etc. ‘Padma Vibhushan’ is awarded for exceptional and distinguished service; ‘Padma Bhushan’ for distinguished service of high order and ‘Padma Shri’ for distinguished service in any field. The awards are announced on the occasion of Republic Day every year. This year the President of India has approved conferment of Padma Awards to 112 persons as per the list below. The list comprises of 10 Padma Vibhushan, 19 Padma Bhushan and 83 Padma Shri Awardees. 19 of the awardees are women and the list also includes 10 persons from the category of foreigners, NRIs, PIOs (include one posthumous) and 4 Posthumous awardees.